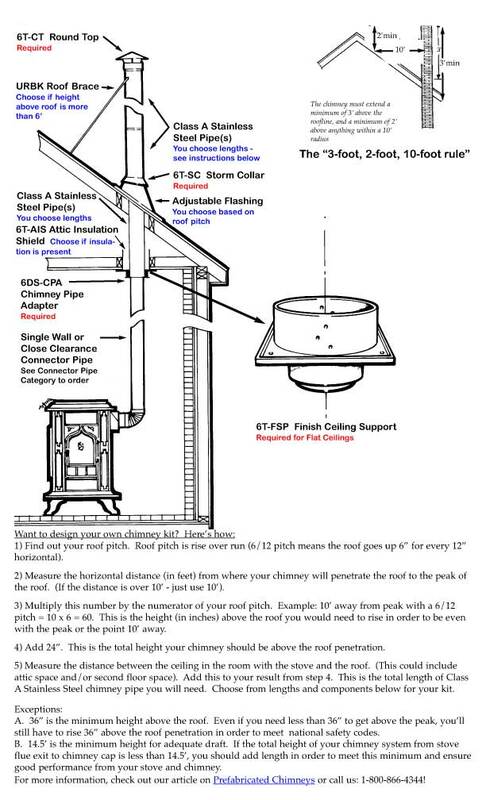 This chimney kit details the peices you would need to pass through a flat ceiling, attic space or second floor, and terminate above your roofline. See the Connector Pipe category for selecting pipe to go between the stove and the ceiling. 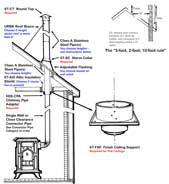 Please refer to the article "Prefabricated Chimney" for a detailed explanation of how to plan and install your chimney kit. Required as fire protection in ceiling cavities by preventing insulation from coming in contact with chimney pipe. Normally used in conjunction with a Finish Ceiling Support or Firestop. Provides required clearances for chimney pipe in multi-story installations and prevents spread of fire between stories. Required at each ceiling except where Finish Ceiling Support Kit is used at first floot level. Not required where pipe passes through roof. Used to provide required clearance from joists and insulation in mobile home installations. Can be used to trim flat ceiling or soffit penetrations at pass through for chimney pipe in multi-story installations. Used in conjunction with Firestop/Joist Shield.